Here’s my “Freaky Friday Fashion” pick for the week. 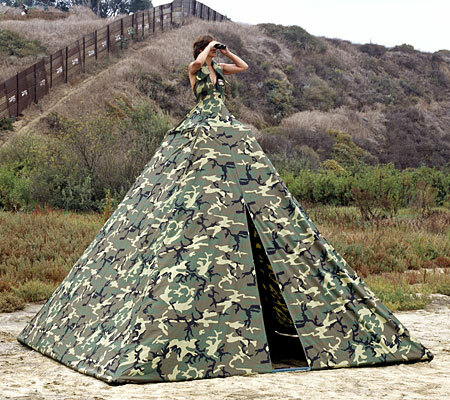 A tent dress! Brilliant idea for getting out of dirty camping trip deeds. 1. Thou shall not go on hikes (my dress won’t make it up the hill Dear). 2. Thou shall not make a tent (because I’m wearing my own). 3. Thou shall not go on scavenger hunts (I don’t want everyone throwing their treasures in my tent). 4. Thou shall not go fishing (because…ewww! I don’t want stinky fish smell on my dress). 5. Thou shall not fetch water (it’s too hard to carry buckets in this dress). 6. Thou shall not sit around a campfire and tell stories (it’s too hard to sit in this dress). 7. Thou shall not feed the animals (I don’t want them taking up residence in my tent). 8. Thou shall not swim in the lake (my dress might sink). 9. Thou shall not let strangers in my tent (well, because, you never know). 10. Thou will promise to stay put and keep watch. In other words, I’d prefer to go to Rome.